Just like rumors suggested, the iPhone 6s casing is slightly taller, wider and thicker. Some people suggested that this minor enhancement was to accommodate the hardware needed for Force Touch, but it actually might be more than that. The iPhone 6s casing measures 138.26mm by 67.16mm (versus the 138.09mm by 66.91mm iPhone 6), so the iPhone 6s has become slightly taller and wider. A bigger change is the internal strengthening of the casing, Apple has actually increased the thickness along the power and home buttons up from 1.14mm to 1.9mm. These changes make the iPhone 6s casing as a whole a lot more rigid than the iPhone 6 casing. As promised, we are back this week with a much more in-depth look at the iPhone 6s back casing. Even though this alloy was designed to be used for the Apple Watch, the same reasons to use this metal for the iPhone 6s apply. Our friend Lew from UnboxTherapy actually brought the iPhone 6s shell to Elemental Controls to get the elemental makeup of the shell analyzed. He found that the aluminum on the 6s shell has a much higher content of both zinc and magnesium than standard alloys, proving that this is series 7000 aluminum. One other thing that Lew found was the anodization on the iPhone 6s shell is much thicker. The increase of anodization thickness is most likely present because zinc can corrode, and a thicker coating can prevent corrosion from happening. As it stands right now, series 7000 aluminum is expensive. However, most likely consumers will not see this expense. This change does show that Apple is taking durability seriously by strengthening the phone with better materials while keeping the price the same. Lew was given a makeshift force meter to test the durability of the iPhone 6 and 6s shell under pressure. He found that the iPhone 6 bent under 30lbs of force at the two weak points on the iPhone 6 shell. 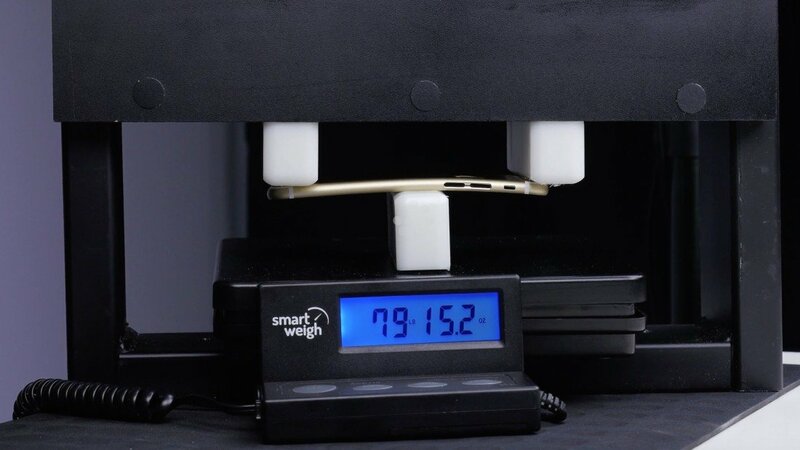 The iPhone 6s did much better under pressure, and it didn’t bend until 80lbs of force was applied. That means that the iPhone 6s shell is over twice as strong as the iPhone 6 shell. What does this mean for consumers? Not only do they get a much stronger iPhone due to the switch to series 7000 aluminum, it also means that they get more scratch resistance due to that thicker coating of anodization. Apple takes their product design seriously, so it’s good to see them make their products more durable. If you want to check out our friend Lew’s video on UnboxTherapy, click below to watch!